Tucked away off the main road this isn't an easy pub to find. As a previous reviewer has mentioned you need to know it's there as you would not find it otherwise. With my trusty GBG I managed to locate it. With plenty of museums and embassies in the area I imagine the place must get very busy. Luckily I visited early afternoon when the lunchtime visitors were just finishing. The pub caters as much for food as it does for drink but despite this there are plenty of real ales available, albeit not an imaginative selection. Landlord, Speckled Hen, London Pride, Adnams Broadside and a couple of Sharps were on offer on my visit. The pub has a comfortable feel to it and the staff are very friendly and helpful. My 2nd GBG tick on a Friday afternoon while in South West London. 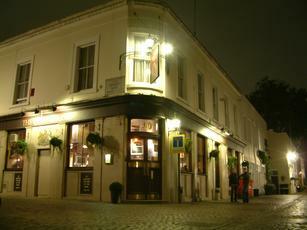 The Queens is located in a mews just off of Queens Terrace and in my opinion you would need to know its here to find it. A charming pub that once you enter you realise it probably makes more money on food then booze however 8 hand pumps with 3 house ales and 5 guests no doubts help bring the punters in, in addition there is a large list if high quality lagers and craft ales on keg. My choice of Roosters Little Bird @ 3.4% was good. The pub was packed, there was a large party in for there Christies dinner as well as several other large parties eating and drinking so there was quite a buzz about the place. Only stopped for 1 beer but it was a good beer and another pub ticked from the 2016 GBG. Foolishly arrived this lunchtime without having reserved a table so we could only sit side-by-side tucked up in a corner and, because of this, we decided to move on elsewhere to eat. However, the beer range was excellent with 8 handpulls including London Pride, Doom Bar, Woodfordes Flagondry, Navigation's Icebreaker, Sambrooks Junction, a milk stout and, my choice, a very good Wadworth's Orange Peel. Never having heard of some of these offerings, I would certainly revisit to see what they have in the future. The Aspall's Perronelle's Blush seemingly on tap was only actually available today in bottles but that didn't matter. I quite liked this pub, located in a mews, slightly off the beaten track, but actually fairly close to Exhibition Road. There seems to be few decent pubs in this area. So this is probably the best option if you find yourself visiting the Natural History Museum or the Royal Albert Hall. But you would never imagine there would be a pub located here, unless somebody had told you about it. I loved the doors on the corner, pushing them gingerly in case they were one of those sets of doors that have now been locked shut to make room for extra seating (that you seem to find everywhere these days). They are quite unique. The interior seemed quite nice. But you quickly realise that the focus is on diners. There were no tables available initially and you can feel quite uncomfortable standing at the bar, which is quite a cramped space. The drinks range is good. Ales on were Fullers London Pride, Sharps Doom Bar, Red Squirrel Scottish Ale, Roosters 41 Degrees South, Great Yorkshire Top of the Hops, Sambrooks Junction, Moorhouses White Witch & Stewart Zymic. Initially I did not spot the real cider. Westons Old Rosie was hidden away at the end of the bar, behind the glass washer and racks of glasses. So I plumped for one of the 4 keg ciders - Thatchers Old Rascal. That's the first time I've seen this on keg. Hogans & Aspalls (Original & Perronelle Blush) are also available. The staff and patrons do seem to look down on you a little, if you're not dining. But otherwise, this was quite a pleasant find. I'd love to give this place higher rating than the 6 I did: it's got good beers that are regularly changed and kept in good nick; the place looks good and they don't gouge ones eyes out on pricing (this is a relative comment given the location and lack of choice around here in general). And its proximity to the RAH is fantastic. However, it's really aiming for the gastropub and half the seating is reserved for diners. There isn't much space otherwise and I get the impression that unless one gets here mid-afternoon then forget finding somewhere to sit. And the way the bar takes up space between the seats it's really cramped and not terribly pleasant to stand (especially in winter as there's nowhere to put coats).